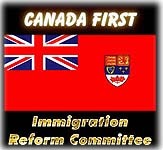 The Canada First Immigration Reform Committee was founded in 1997 to fight for the ignored Canadian Majority in immigration matters. CFIRC believes that Canada’s immigration policy should reflect the will of the Majority, rather than the desires of selfish special interest groups. CFIRC believes that the composition of a nation is one of the most important political questions there is. Any immigration policy should be ratified in a binding national referendum. This site is dedicated to the reform of the current Canadian Immigration System which is, by literally all accounts, not working. The Canadian populace has never been given an official voice in Immigration, and this has led to widespread anger and resentment of the Canadian Political system and many Canadian politicians. Canadians need a binding referendum on Immigration and immediate reform of the current dilapidated system.